Glitters: LA Girls Nostalgic, Spoiled by Wet N Wild Jewelry Heist, Milani Hot Pink and Sephora by OPI To the Glitter End! Let's try descriptions: Nostalgic is a sea foam green, turquoise that has small glitter mixed with huge hexagonal glitter of the same color. Jewelry Heist grabbed me because it was a twist on rose pink glitters. Huge rose pink and gold hex glitters, tiny multi colored square and hex glitter. Milani Hot Pink is huge hex hot pink glitters mixed with fewer 3D silver hex glitters... silver but depending on what angle it reflects blue,green, yellow,etc. 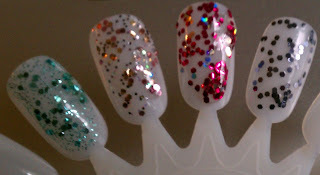 and lastly Til the Glitter End! is a dark silver, pewter glitter. I have a black glitter and the glitters don't shine, so this for me is an alternative. 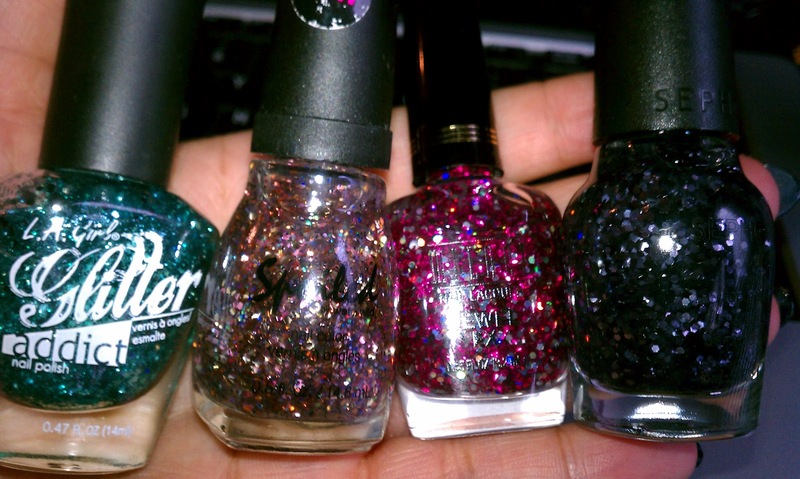 These are all better used as layering glitters. Nostalgic is on my current mani and Hot Pink looks like a great Vday mani for the win! 1- Sephora by OPI retails for $9.50. I can get OPI retail $8; online for cheaper. I'm over it already. This may be my last polish by Sephora by OPI. I love the collection mini sets though. 2- I think the Spoiled by Wet N Wild collection is solid. It covers neutrals, brights, glitters, grays and blackened/deepened colors, cool names and all with an affordable price tag. 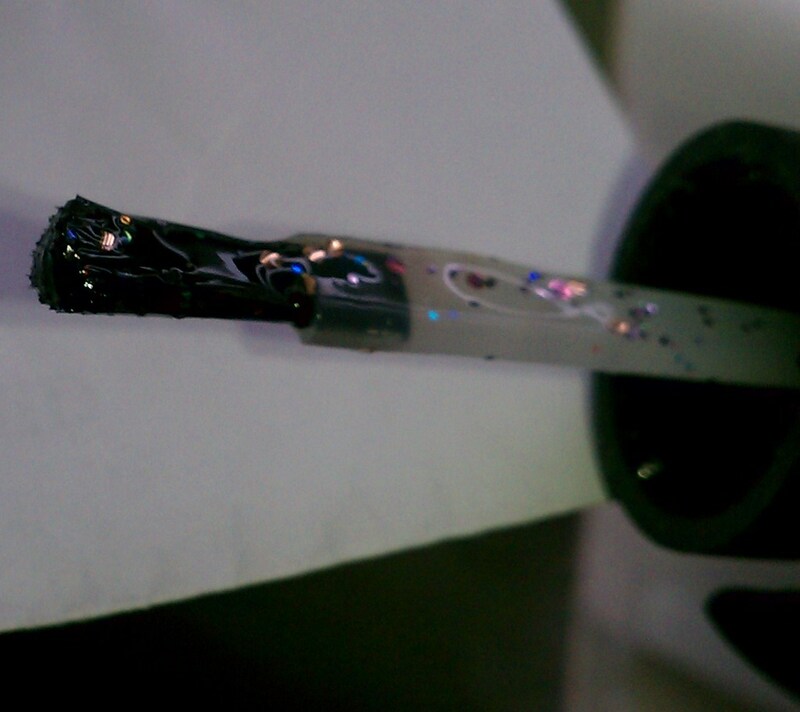 BUT.. this brush for the glitter is ridic and ugly. 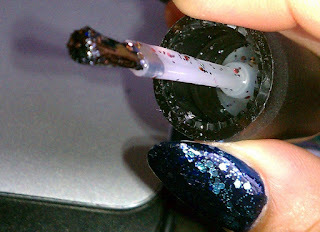 I don't polish my own nails often or think much about the brush, but when even trying to swatch the glitter this brush caught me by surprise. While it's supposed to be tapered, the end of the bristles looks unruly giving the brush a thicker spread at the bottom. It was really awkward when trying to place the glitter. I seriously hope the brush in the regular colors are not like this. Is this a problem for you guys??? 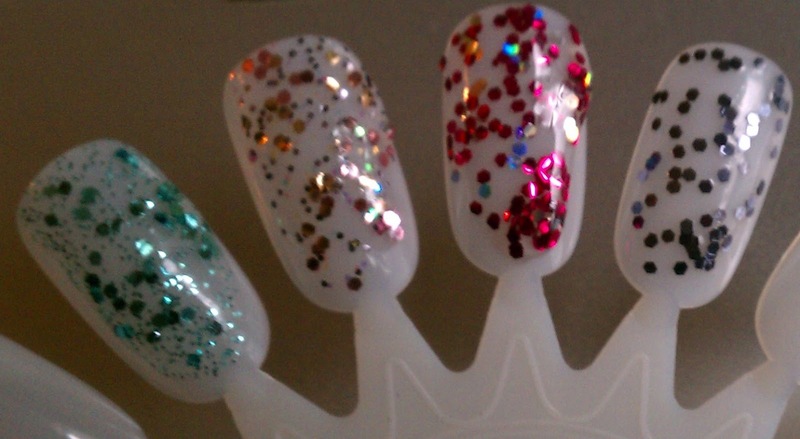 Are you in glitter love right now? 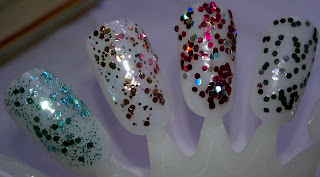 What are your favorite glitters? i love how glitters look on the nails but i hate how much of a pain it is to remove....i look forward to seeing that hot and pink color! 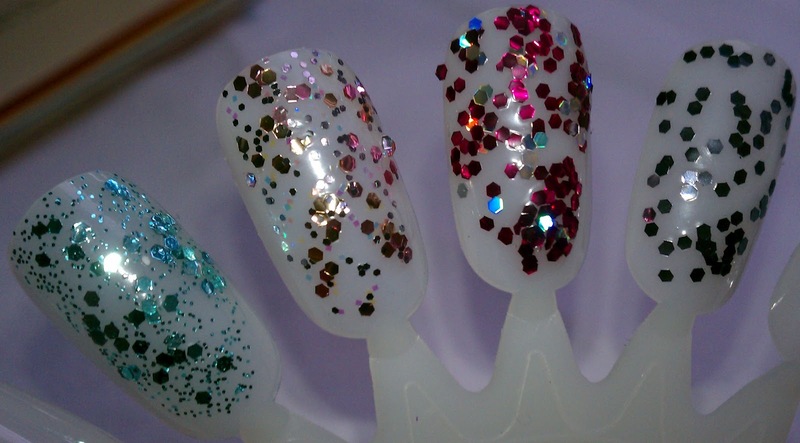 Gorgeous glitters. I love Wet n' Wild. Always solid.